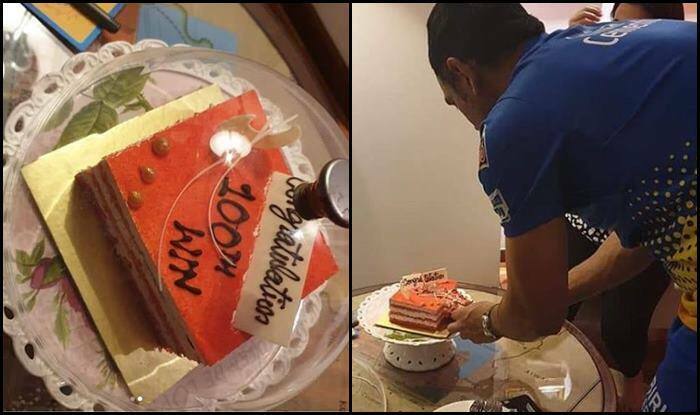 Chennai Super Kings skipper MS Dhoni's 100th Indian Premier League win was marred by controversy but that did not deter him from celebrating the commendable occasion. Former Indian skipper MS Dhoni’s 100th Indian Premier League (IPL) win against the Rajasthan Royals (RR) was marred by controversy. CSK defeated the hosts four-wickets at the Sawai Mansingh Stadium in Jaipur on Thursday. The event captured the attention of fans and critics for all the wrong reasons after the no-ball controversy involving the match umpire Ulhas Gandhe and MS Dhoni. The visitors displayed a good bowling effort to restrict Rajasthan Royals to a modest 151/7. In the match, the CSK skipper intervened the game of play to confront the match official Gandhe for a ball by Rajasthan Royals’ Ben Stokes which he deemed as ‘no-ball’ but it wasn’t given by the umpire. The act was surely beyond his jurisdiction and drew major criticism. The 37-year-old was also fine 50% of his match fees for breaching the IPL code of conduct. The ball which led to the controversy — a waist-high full toss — which led to the controversy was in the fourth ball of the innings, it was delivered by the English bowler to New Zealand international Mitchell Santner. Although it seemed like Gandhe would signal no-ball, he decided otherwise after a quick thought. Despite the protest by CSK’s Dhoni and Jadeja, they had to settle for the decision taken by the match umpire.